Being a sports parent is tough, there is no doubt about it. It truly is one of the most difficult things I have ever gone through. But before I go on with my post, I feel a little background on myself needs to be addressed. 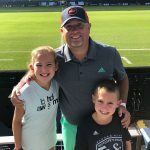 I was a teacher and coach for ten years, and those were some great and terrible years, but I learned so much about being a coach, working with athletes, and while I wasn’t a parent at the time, I learned a great deal about parents. Communication between coach, player and parent is paramount. Whether it is a friendly talk before practice, or that tough conversation over playing time, communication must happen. Coaches must include parents, especially at a young age, whether they like it or not. Coaches cannot and should not ever be too busy for a parent. For the most part, players have no idea what their parents are doing or saying, so never hold it against the player. Parents are crazy! They have crazy ideas, crazy expectations, but most importantly, they are crazy about their player. This may be a tough concept for young coaches to understand, but after coaching and now being a parent, there is nothing I have ever been prouder of or more passionate about than my kids. So, where am I going with this? Well, my kids are both hitting that age where they are getting involved in various activities and sports, and this world is crazy! Kids are intense, coaches are intense, parents are… INTENSE, and to top it all off, this stuff is crazy expensive. For many families, youth sports is a financial sacrifice, so to think the intensity and expectations are going to be “normal” seems to be a little “un-normal”. As a parent, I look on the field, court or tumbling mats and see my kids. I see them first over anyone else out there. I am proud of them and I love watching them play and perform, and I am 99.9% sure that all parents feel the same. But, I also feel I can be realistic of my kids’ talents and keep realistic expectations. However, and I stress however, there are moments where you see your child do something that a majority of their peers or teammates cannot, and things can get away from you in a hurry, extremely fast. This has happened to me, I’ve seen it happen to other parents and I can guarantee it will continue happening when my children have children. So, once again, where am I going with all this? Well, after a few seasons of youth sports and ten-plus years of coaching, I wanted to make note of some of the things I have done or witnessed to maybe help the next guy on their journey. Coaches, for the most part (we’ve all seen and heard stories), are great people with great intensions. They are competitive, they want to win, they want their and your athletes to perform well and they care about their players. You are going to meet some great people along the way in youth sports, and you are also going to meet some crazy ones. Don’t be afraid to take a step back and remind yourself why you signed your child up for their sport. DRAMA! There will be drama. It can come from coaches, parents and even your player, but know, there will be drama. Don’t compete! Don’t compete with other parents, don’t compete financially, don’t compete with other players, DON’T COMPETE. This can turn in to a nasty battle that doesn’t end well for anyone. Enjoy new friends, enjoy their athletes and enjoy the relationships your child will develop. Celebrate everyone’s successes, and most importantly, celebrate the team’s successes. Trust the coach’s intentions, but don’t be afraid to ask questions or express concerns to get a better understanding. I highly suggest doing this at the end of the season, not during. Your player may have a “gift”, but it is your player’s “gift”. Sit back, ask them what they want to do and let them do it. If they want to “specialize” in one sport, let them. If they want to play multiple sports, let them. There is no harm in being active in multiple sports or just one sport as long as they are active and enjoying it. If your player wants to play more or train more, let them. If your player wants to take a break, let them. Not everyone is going to believe in the same things as you. Some will believe in more games, some will believe in more training and some will believe in doing nothing extra and guess what? Everyone is correct. In the end, remember, there are going to ups and downs, challenges, successes and celebrations in youth sports and you; the coach, the parent and the athlete can choose how you handle all of these situations.